Oregon State University Athletics’ mascot is the Beavers. Beavers build dams. The Corvallis Clinic’s cause is Project H.E.R. (Help. Enlightenment. Resources. ), a cancer support program that supports cancer patients and their caregivers. The partnership between the university and our medical clinic is to provide Cancer Awareness support. Together, we created the campaign, Dam Cancer. Dam Cancer includes a “Pink” awareness campaign at major athletic events at the university. At each event, cancer survivors are recognized. Teams wear pink uniforms. Dam Cancer fans are encouraged to wear pink in support, survivors are celebrated, and special activities increase awareness and raise funds for cancer patient support. 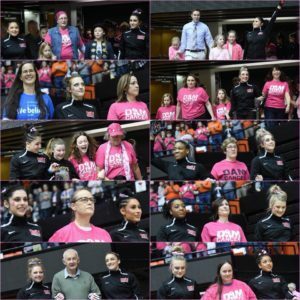 Women’s volleyball, soccer, gymnastics, basketball, golf, and swimming hold Dam Cancer events for thousands of fans. In total, the Dam Cancer program has raised more than $45,000 in Project H.E.R. support.